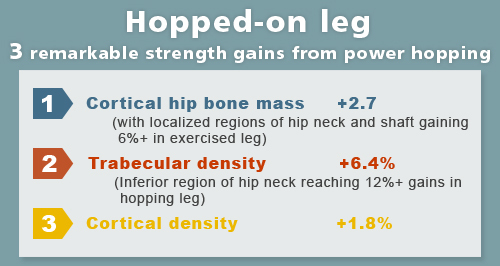 • At the year's end hip cortical mass and trabecular density had increase substantially in both legs with greatest gains accrued in the hopping leg. Alison, Sarah. The influence the Hip-Hop of exercise on 3D distribution of cortical and a trabecular bone across the proximal femur: The Hip-Hop Study. ASBMR Abstract 1013, 2014 Annual Meeting, Houston, Tx Sept. 12, 2014.